I wrote recently about the creative stuff Nine Inch Nails is/are doing to promote his/their new album. It was finally released yesterday, and the disc itself holds even more fun features. 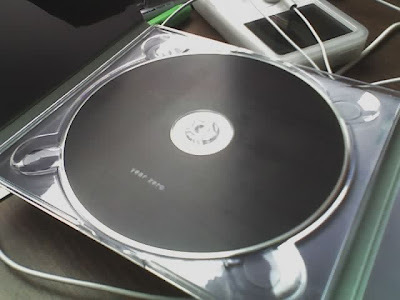 I didn't notice this myself until I read it online, but the disc's colour is sensitive to heat. 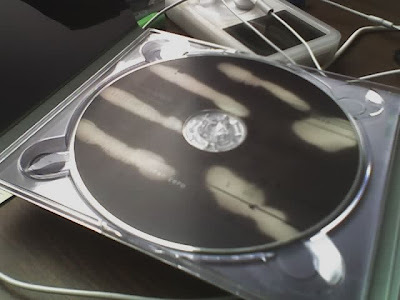 It's black when you buy it, but after spinning in a CD player and heating up for a while, it becomes white. Cooooool. It also reveals binary code that leads to a web site involved in this whole viral marketing campaign. That's stuff you can't get by downloading a CD (illegally or otherwise). And I'm pretty sure this album will sell quite well, despite the fact that it's been available to listen to for free from NIN's official web site for a while now. This is how to combat piracy - use media and technology to the artist's advantage rather than trying to suppress it. As for the most important part, the music, it's all good too. It's a much "noisier" sound than The Fragile or With Teeth, but noisy in an electronic sort of way (vs. the guitar sort of noisy in Broken or Downward Spiral). And it sounds fresh and unique, despite the fact that NIN's influence has leaked into nearly every genre of music since the 90's. I give it one thumb up, on a scale of zero to one thumbs.